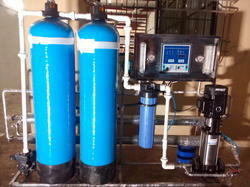 Heavy Duty residential Reverse Osmosis System. Stage 1: Removes dirt, sediment, sand and other physical particles. Stage 2: Granular Carbon Filter which reduces chlorine, organics, odor, smell and turbidity from water. 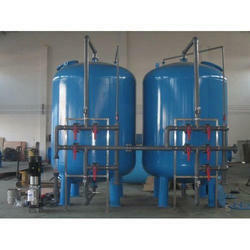 Stage 3: Block Carbon Filter that further reduces chlorine, odors and other chemicals. Stage 4: Reverse Osmosis Membrane in which bacteria, heavy metals, salt, bad mineral substances and other dissolved matter and chemical drugs are removed from water. Stage 5: Rear anti-bacteria activated carbon filter that improve the taste of water. Supported by the team of diligent professionals, our firm is instrumental in offering a comprehensive array of Drinking Mineral Water Plant. The given plant effectively purifies water and is widely acclaimed in the market due to its impeccable performance and sturdy design. Our expert professionals design the provided product by employing advanced technology and utilizing best grade components to meet all the industrial standards. We offer stringent quality check of our products on various parameters to ensure their quality and performance. 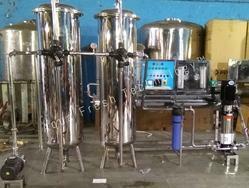 With our rich industry experience, we have established ourselves to offer a wide array of Industrial SS Reverse Osmosis Plant.These products are manufactured by the experts using high grade quality components. Moreover, to ensure the compliance of the offered products with the defined industry standards and quality parameters, these products are tested on various levels by quality experts. Also we are providing these products at leading market price. Removing suspended solids smaller than 40 microns requires filters with either two or three layers of filter media. These are referred to as dual-media filters or multi-media filters. When sized properly and with the correct configuration of filter media, these filters can remove suspended solids as small as 5 micron. 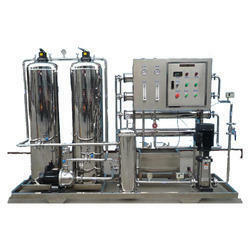 Looking for Industrial Reverse osmosis & Commercial System ?